Jen and I were in Pittsburgh last weekend for a wedding in the family (congrats Lauren & Neil! 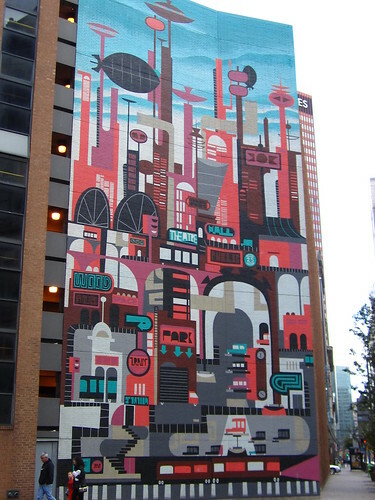 ), and while exploring the area around our downtown hotel, we came across this great mural. Jen's reaction: "Take a picture! Blog it!" So here it is, in all shades of grey, purple, red, and turquoise. The scale is pretty impressive (see the folks in the lower left?) and the design is both retro and futuristic. Much more interesting than a big, blank brick wall, no?